The conference booking does not include accommodation. 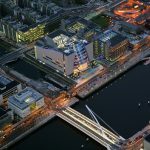 The conference venue address is Convention Centre Dublin, Spencer Dock, N Wall Quay, North Wall, Dublin 1, D01 T1W6, Ireland. Below are just a few hotels that are close to the venue. Dublin is a large city with many hotels and apartments suitable for different budgets. The best way to find a hotel is to look on something like Expedia or Booking.com. When booking your accommodation we advise you to check the walking distance between your hotel and the conference venue using something like google maps. You could also look for rooms or apartments using something like AirBnB.